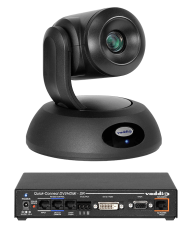 The Quick-Connect DVI/HDMI Interface is built for the ClearVIEW HD-18, HD-19, HD-20, HD-20se and PowerVIEW HD-22, HD-30 high definition pan/tilt/ zoom camera, with a 1/3-inch, 1.3 megapixel CCD imaging sensor, a glass multi-element wide dynamic zoom lens (18x optical), a tally light and a 1.8-lux rating, providing superior images in a wide range of high-definition video applications. 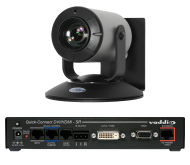 The Quick-Connect DVI/HDMI SR Interface delivers simultaneous analog component video (YPbPr) and digital video (DVI-D or HDMI) outputs on separate connectors, ideal for multiple monitoring and large projection systems. 1-RU Rack Panel for 2 Interfaces This optional rack panel is compatible with the PresenterPOD and Quick-Connect DVI/HDMI Interfaces.